In Yemen's south, says an MSF project coordinator, "Armed clashes have been replaced with indiscriminate violence from bombing attacks and accidents involving landmines." A young patient at an MSF hospital in Yemen's south, last May. On August 4, a suicide bomber attacked a funeral service taking place in the southern town of Jaar in Yemen’s Abyan province, killing over 40 people and injuring many more. Some 50 casualties were admitted to the Doctors Without Borders/Médecins Sans Frontières (MSF) emergency surgical hospital in the town of Aden, where medical staff worked through the night to manage and treat the influx of patients. The following day, three people—two of them children—were admitted with severe blast injuries after coming into contact with unexploded devices in Jaar and Zinjibar. In this interview, Anne Garella, MSF project coordinator in Aden, discusses the ongoing violence in the south and the difficulties faced by patients trying to access adequate health care. How were you able to deal with the casualties from the August 4 attack? The entire team dealt with this mass casualty with a lot of professionalism, although the situation was very hectic, to say the least. We treated 39 patients in addition to 10 who had died on arrival or soon after. Many patients had minor injuries but more than 10 were in very serious condition. We were very concerned about the security of the hospital and the patients: when such an attack occurs, and we are treating patients that have been targeted by an explosion, the level of tension among family members reaches its peak. Thanks to the professionalism of the team, particularly the guards, we were able to keep the situation under control. How would you describe the hospital’s relationship with local communities? It was striking to see that so many casualties from the bombing were brought directly to our surgical hospital, without first being referred by their local hospital. This shows that our health facility is well known by the local population and that the people of Jaar trust the quality of care provided by MSF. The fact that the situation in the hospital, while tense, remained under control is also a good sign that the neutrality of our facility is respected, especially in such difficult circumstances. Having said that, building trust with the community and negotiating our humanitarian space is a continuous effort, and we always work towards ensuring that our ethical principles are clearly understood. How has the situation in Abyan evolved over the past three months? Levels of violence have not decreased, but the nature of violence in Abyan has changed. In towns like Jaar, armed clashes have been replaced with indiscriminate violence from bombing attacks and accidents involving landmines. While activity in our hospital in Aden has fallen compared to June, admissions still remain high. We usually have around 40 beds occupied at any one time, and it is rare to have fewer than 35 patients at the hospital. The road between Jaar and Aden has now completely reopened, which has made it much easier for us to transfer patients to Aden through our ambulance service. In the past, there were road blocks and on [some] occasions we had to resort to using a dangerous and lengthy mountain road, meaning that many patients preferred to stay at home and hope for the best rather than take the risk of traveling. While displaced people have returned to Jaar in recent weeks, and the government has been active in resuming key utility services, the people of Zinjibar have yet to go back and it is not clear when they will be able to do so. Most of the town was destroyed by fierce fighting over the past year, and the land is rife with mines and other unexploded ordnances. Key services such as electricity and water have not been restored either. How have landmines and unexploded ordnance affected people’s lives? It is children who have been most affected. They play with objects they find, knowing at times that it is dangerous, and their lives are shattered as a result. 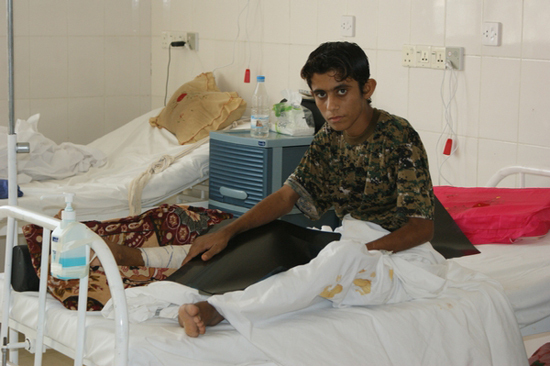 The day after the bombing in Jaar, we received three patients who had been injured by unexploded ordnance, two of whom were children whose limbs had to be amputated. They came from Al-Rawdah, which had been declared mine-free the day before. Since June, we have treated 22 patients for injuries caused by unexploded ordinance, three of whom died from their injuries. Aside from the physical effects, the psychological suffering is something that needs to be addressed to allow these children and their parents to return to their normal lives. Greater efforts are needed by the government and the international community to clear mine-affected areas and to educate local communities about the risks. What are the key medical challenges in the south? Primary and secondary health care remain poor because the necessary infrastructure is not properly maintained and corruption is endemic. Limited access to health care because of insecurity remains a key problem. More violence means that people are afraid to travel to their nearest health post, and in some cases when they do go, doctors are not on duty. Financial difficulties also mean that people often have to choose between seeking medical care and feeding themselves. Furthermore, the depletion of water resources, land disputes among tribal groups, and increased fuel prices are also exacerbating food insecurity for rural populations increasing levels of chronic malnutrition. MSF has been working in Yemen since 1986 and continuously since 2007. In addition to the governorates of Aden, Ad-Dhali, Abyan, and Al-Baydha, the organization conducts surgical and medical activities in the governorates of Amran and Hajjah in the north of the country. In Yemen, MSF does not accept funding from any government and chooses torely solely on private donations.